Great News from Greenland | Watts Up With That? I recently returned from a trip to Greenland’s Jokabshavn Glacier, which discharges more ice than any other in the Northern Hemisphere. Our route of flight from Reykjavik traversed the ice cap from about fifty miles north of Angmassalik to the airport at Ilulissat, on Disko Bay, about one-third of the way up Greenland’s west coast. In southeastern Greenland, we flew very close to the country’s second-highest peak, Mt. Forel (11,099 feet), and in the near future I will upload a image of a nearby mountain approximately 8,000 feet high completely covered by the ice cap. It is obvious from the air that there is very little movement over the deepest regions of the ice, and the drift patterns in the lee of some of the submerged peaks are strongly suggestive of at least some regional accumulation. There is virtually no evidence for summer melt in the southeast, while the southwest portion of the ice cap is known to melt and refreeze at the surface on an annual cycle—I saw considerable evidence for multi-year, but small, lakes in that region. In preparation, I read just about everything I could get my hands on, including a recent very remarkable paper by Dorthe Dahl-Jenson and about 70 coauthors. Dahl-Jensen heads up the Center for Ice and Climate at the University of Copenhagen. Dahl-Jenson’s team drilled to the bottom of the ice in northwestern Greenland, providing us with the first climate history of Greenland that includes the warmest period in the last interglacial period, from about 128,000 to 122,000 years ago, known as the Eemian. That was embedded in the Sangamon Interglacial, which ran from approximately 135,000 to 95,000 years ago. One of the reigning myths in climate science is that interglacial temperatures in Greenland were about five degrees (C) above modern, causing a dramatic loss of ice and raising global sea levels about 6 meters (19 feet). Ice cores from southern Greenland in fact have wood and vegetation at their lowest levels, which are younger than the Eemian. By measuring the ratio of two isotopes of oxygen (specifically 18O to the much more common 16O) one can infer the air temperature at the time that the snow in each annual layer crystallized. This technique has been around for decades and is considered quite reliable, and it correlates well with other temperature “proxies” that Dahl-Jensen also used. Dahl-Jensen found that the average annual temperature peaked at a whopping 8 +/- 4°C (that’s 7 to 22°F!) warmer than the recent millenium in the ice core during the Eemian maximum. And still the ice survived. In fact, the top of the ice was only a mere 130 +/- 300 meters “lower” (actually from 557 feet higher to 1411 feet lower) than today. For perspective, her entire ice core was about 8,000 feet in depth. If, like ex-NASA employee James Hansen, you think that global warming is going to drown us all by melting almost all of Greenland “in a hundred years” (Hansen’s words), perhaps you should try another apocalypse. According to the chart shown in Dahl-Jensen’s paper, the entire 6,000-year period averaged about 6°C warmer than the last 1000 years. The integrated heating in this region during the Eemian maximum appears therefore to be approximately 36,000 degree-years (temperature change multiplied by time). Evidence suggests that sea levels during the Eemian were about 4-8 meters (13-26 feet) higher than today. Although the documentation of ice thickness at one location on the Greenland ice sheet cannot constrain the overall ice-sheet changes during the last interglacial period, the [Eemian core] data can only be reconciled with Greenland ice-sheet simulations that point to a modest contribution (2 m) to the observed 4-8 m Eemian sea level high stand…These findings strongly imply that Antarctica must have contributed significantly to the Eemian sea level rise. Whew! Thus does one revolutionary paper shoot pretty much the entire global warming sea-level catastrophe—the one worth being concerned about—through the heart. Antarctica is so cold that it is projected to gain ice in the coming century, as slightly increased precipitation—which may have recently been detected—falls as more snow, which compacts into more ice. This puts any sea-level crisis out in the hundreds-of-years realm, at least, and probably far beyond our current era of burning hydrocarbons for energy and heat. In other words, forever. As for Greenland, I have some bad news about the Jakobshavn Glacier. Its 30 X 6 mile (spectacular) Ilulissat Icefjord is going to be much less spectacular very soon, and I’ll also wager that the quick retreat of the glacier is literally grinding to a halt. Better go to Ilulissat soon—in the next year or two—to see what was outside my hotel window (live webcam here). The spectacular nature of the fjord is a result of the massive icebergs—some a half-mile wide or so—that break off (calve) from the glacier, float down the fjord for a year or two, and then get stuck in the terminal moraine (laid down during the last glacial maximum, probably from circa 1600, when the Little Ice Age wiped out the Greenland Norse), where the fjord empties out into the ocean. When glaciers turn from tidewater to grounded, their recession rates usually slow dramatically (or, in some cases, they stop). This has probably started to happen. So get your tickets for next summer (or later this summer) now, before the big bergs are gone. And, before you go, don’t forget to read up—you just might come across some revolutionary good news. Dahl-Jensen, D., et al., 2013. Eemian interglacial reconstructed from a Greenland folded ice core. Nature 489, doi: 10.1038/nature11789. ← Hot weather and climate change – a mountain from a molehill? Just what are those alarmists gonna do with this tale? Can’t wait to hear what the CAGW crowd think about this. They won’t like it! Thanks, Patrick, I love a bit of good news in my day. No GIS meltdown, no catastrophe, even at six degrees C hotter than now, which isn’t going to happen. Probably not even the picked out of clear air supposedly scary two degrees, at which elevated temperature it would take over 100K years to melt the whole sheet, during which time of course another ice age would be occurring with much lower temperatures. Does anyone have a clue what exactly made the Eemian so much warmer than the holocene? Your fly-by tells me nothing. At best a data point. It takes years or decades to make such a determination, for such poorly understood “plastic” flow. Most interglacials have been warmer. The usual suspects are insolation, orbital mechanics & albedo, but who knows, really? At SkS, they also try to implicate rapid change in CO2, since the highest absolute concentration was probably less than today’s c. 400 ppmv. Great article, Dr. Michaels. Thank you for taking the time to report back. It was a refreshing to have a well-informed eyewitness account and, written in such an engaging, enthusiastic, style, it was a pleasure to read. He is quoting relative temperatures (warmer than current is the exact language) meaning that the current temp is about 15 degrees F.
4 C or K degrees = 4*1.8 =7.2 F degrees. Interpreting his statement (“8 +/- 4°C (that’s 7 to 22°F!) warmer than the recent millennium”) to apply to the recent global millenium temperature (used to be 15 C but lately I see people are saying it is now 14 C–WUWT? ), he is saying the Eemian global temperature was somewhere in the neighborhood of 18 to 26 degrees C. If we have the dreaded 2 C warming by 2100 we will still be 2-10 C cooler than the Eemian. I’m puzzled; where does the wood in the lowest ice core levels come from, if it’s *younger* than the Eemian (the last interglacial)? Especially if Greenalnd didn’t melt in the Eemian? The Eemian was so warm that you can find Hippopotomus fossiles on the Thames in the UK, so if Greenald did’t melt then, I see no chance of it doing so now. Thank you for this report. It was a superb read, and does indeed take the air out of the sea level rise hysteria. I think one of the key points is the issue of the Antarctic increase; seems to me that the water for it has to come from somwhere, so I would not be surprised to see the gradual sea level rise of the last few thousand years diminish or reverse. You and Willis could start a travel magazine. Well in a related matter, the news says that Jason-1 sea level satellite is dead; but is going to remain as space junk for 1,000 years. Why didn’t they think to put a de-orbit system on these things to reduce the clutter? sooner or later, somebody is going to get hurt. But as to the Greenland glaciers; nice to know there will be ice for all the polar bears hiking over there. Thank you, so much! I almost didn’t post that, for I had a feeling I was missing something… . Thanks for telling me what that was! Sorry to interrupt the otherwise high-level science discussion. Thw CBC did a “news” segment about how climate change and global warming (yes they actually said GW) is going to effect agriculture etc. Not one word about record cold winters the past few years. I have problem with these so called temperature readings of old times in ice cores. Since temperature is affected by elevation, how have they figured out what the elevation was when the snow fell many thousand years ago? Thanks Dr. Pat – sounds like a fantastic trip and a well written post. Because almost no one does this the distinction has to be inferred. Another mistake folks make is to use the temperature scales data as though they are ratio data. For example, say it goes to 60 degrees in the afternoon from a low of 30 in the early morning. If you hear someone say the temperature doubled, there’s the error. Play with the numbers a bit. Convert the 30 & 60 from F. to C. and check whether it has doubled. Use the Kelvin temperatures to make such a calculation. This is a common source of confusion. The writer wrote that it was 8 +/- 4C warmer. Or in other words. 4 to 12C degrees warmer. This is NOT the same a temperature of 4C or 12C, but rather 4 additional C (or Kelvin) to 12 additional C warmer. Stay with me here. So you only need to multiply by the scale of 1.8 and not be concerned with the offset because when you subtract the two numbers, the offset goes away. So 4C*1.8 = 7.2 degrees F. 12C*1.8 = 21.6 degrees F warmer. One should not lecture the Greenland ice core scientists about basic math. They aren’t going to know what you are talking about. Back on topic, here is a chart of the new NEEM ice core temperatures reaching into the Eemian at 135 Kya versus the previous longest Greenland ice core temperature series as well as Antarctica. The wood and vegetation remnants at the bottom of the ice core from the southern third of Greenland was dated to 4 interglacials ago at 400,000 Kya. This interglacial was the longest one since the ice ages started 2.7 Mya although its temperature maximums were only about 1.0C to 2.0C higher than today. Its just that it lasted for 25,000 years and the southern third of Greenland melted out as a result and small trees even grew there. The current interglacial, by contrast, is forecast to last even longer than the interglacial at 400,000 Kya. Apparently there is no consideration of the so called SCIENCE of interpreting ice cores being WRONG!!! Keystone Cops staggering from one ridiculous mistake to another. Motion in ice fields is quite obvious because it creates an uneven surface characterized by waves (similarly to motion in oceans). They are obviously lacking over much of the eastern and central parts of the ice cap on the route lines we flew (100km North of Angmassalik to Ilulissat). When you get further west you can see much more motion, especially as the cap feeds into the icestreams that flow into the Davis Strait. I hope you will take this phenomenal trip to see for yourself–and before Jokabshavn Glacier completely grounds! I admit that about 20 minutes into the deep part of the icecap I muttered into the window: “Hansen’s nuts”. The buried mountain kind of says it all, along with Dahl-Jensen. > This puts any sea-level crisis out in the hundreds-of-years realm, at least, and probably far beyond our current era of burning hydrocarbons for energy and heat. In other words, _forever_. Well in a related matter, the news says that Jason-1 sea level satellite is dead. Hmmm. I wonder if it suddenly died or if they believe the sensors are degraded because they are showing a fall in sea level instead of a rise. Like the ENVISAT data did before that too was declared ‘dead’ well short of its design life. Thank you for posting this. This is broadly covered in John Kehr’s book The Inconvenient Skeptic and explains why current temperatures in Greenland are cooler than the Eemian maximum and the implications of this such that a layman can follow the reasoning. May be sooner than you think. Recently, I watched a programme on the evolution of stars that suggested that within about 1 billion years, save for bacterial life, conditions on planet Earth would not support life as we know it. The wood and vegetation remnants at the bottom of the ice core from the southern third of Greenland was dated to 4 interglacials ago at 400,000 Kya. Actually no. If you go back to the original publication it actually says probably 400.000 to 1 million years old. This has since morphed to 400.000 years in CAGW circles since this makes it (barely) possible to place it in MIS 11 which was astronomically a close match to the current interglacial. By the way small trees grow in Southern Greenland today too. Very nice story about the Greenland ice sheet by Dr. Michaels! 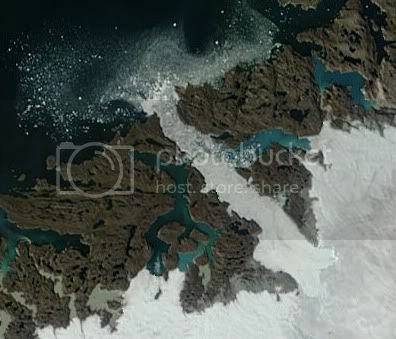 Indeed, spectacular view of the Ilulisat ice fjord and other parts of Greenland, especially from the air. Models for interglacial terminations vary considerably. Perhaps you have a citation for your model. From what I have read, obliquity strongly dominates over precession, and that the interglacial period favored by obliquity would dictate what has been seen geologically, namely we are at the end of the Holocene. Newer models that project an extended Holocene also assume CO2 has a large impact and we know those CO2-temperature models make rash assumptions. One more thing, beliefs in ocean circulation changes during glaciation were found to be in error as they were based on just one sediment core location. After 26 more cores were included in the ocean circulation, it was found that ocean circulation changes very little between interglacial and glacial periods. That throws cold water on looking at ocean circulation as a glaciation proxy. Look, i am not trying to be argumentative here, If you think you have a good model for the Holocene duration, in a paper that is not paywalled, I would be interested in its key assumptions. Thanks. While the temperature at the summit is reproduced from borehole temperatures, the Greenland and Antarctic temperature reconstructions are done by looking at the oxygen and hydrogen (deuterium) isotope changes. The isotope composition of water vapour changes with temperature at the surface on evaporation. Heavier isotopes relative increase with higher temperatures. The same happens when water vapour condenses to water and/or ice/snow. Thus the isotope composition in the ice layers shows the temperatures of the NW Atlantic Ocean for Greenland, where most of the Greenland ice cap originates, the nearby Southern Ocean for coastal Antarctic ice cores and most of the SH oceans for the inland Antarctic ice cores. But they all need to be corrected for any changes in temperature in the condensing zones. The latter gives an error range and still is under much discussion, but the general trends are quite real. “… Kaspar et al. (GRL, 2005) perform a comparison of a coupled general circulation model (GCM) with reconstructed Eemian temperatures for Europe. Central Europe (north of the Alps) was found to be 1–2 °C warmer than present; south of the Alps, conditions were 1–2 °C cooler than today. The model (generated using observed GHG concentrations and Eemian orbital parameters) generally reproduces these observations, and hence they conclude that these factors are enough to explain the Eemian temperatures …” (Wiki). Do you have a temperature graph for this with link? The one I have only shows a peak of about 15,000 years. “Climate scientists who pull up ice cores stretching back 100,000 years regularly plunk broken core pieces into their drinks. The cubes fizz like soda as they melt, because of compressed gas bubbles trapped in the buried ice. “I actually made drinking glasses out of 40,000-year-old ice by hollowing out the inside of a waste core, a byproduct of the sampling we did,” said Ed Brook, a professor of geosciences at Oregon State University. I find the last phrase in this quote rather curious, in the context of the ice core chemical composition reliability. Are the interglacials which happen at nodes of minimum oscillation amplitude of both eccentricity and the precession index, both longer and cooler than other interglacials? This would relate to the current interglacial and those 400k and 800k years ago. On the other hand it looks like maxima in the amplitude of the precession index oscillations destabilize the interglacials, i.e. at 200k and 600k years ago – these interglacials are double-headed and cooler. Jon wonders how temperature can be calculated from O18/16 data. The water vapour is from sea level and transported in clouds to fall wherever. So mountain top snow will tell sea level temperatures from the O18/16 ratios. This gives very accurate data. Of course, the models have overestimated the rate of warming, thus, it would take even longer than 96,000 years, assuming the warming rate continues in the future. Here are a couple shots I took about five years ago, east coast of Greenland, looking due west. The ice has to go over a cliff to get down to the Atlantic. Even if the icecap melts, much of it won’t be adding to sea level, just making a lot of inland lakes. The redundant “accuracy” of the 557 and 1411 really is any eyesore. For those interested, here is a different view of ice breaking from the end of a glazier at the bottom of Argentina, the show is the “The Arrows of Time”. You can hear the great cracking sounds and huge slabs of ice dropping into the lake. Changes in solar insolation, which is a measure of solar radiation energy received on a given surface area in a given time commonly expressed as average irradiance in watts per square meter (W/m2). Changes in the concentrations of greenhouse gasses in the atmosphere. Changes in the albedo of the Earth, which is a measure of how much energy from the Sun is absorbed due to changes in reflectivity of the Earth’s surface, such as from changes in snow and ice cover. I would add a fourth possibility, increased heat flow from the earth’s interior. As Willis Eschenbach has pointed out a few times, one of his regrets is the ironic collateral damage to real environmentalism by green activists/politicians. Like most thoughtful skeptics in this struggle, I too want a clean, healthy environment, clean water and, yes clean affordable energy for all. The “clean” part has been totally abandoned for the vilifying of our precious and productive CO2 levels. I had been hoping that by now, we would have had a few Atlantic salmon return to the Ottawa River and other rivers abandoned by this fish throughout Ontario and Quebec. Also, as a young scientist/engineer working in Africa in 1960s, I had thought that in my lifetime, with newly acquired independence and a treasure trove of resources, this continent would be joining us in health and prosperity. This possibility, too, was even greater a collateral damage (purposeful malice, rather?) commited by people I had thought had their best interests at heart. Either this elitist bunch and their institutions must collapse or competing institutions created (a bank to give Africans reliable cheap electric power for example – they could then do the rest handily by themselves). I’d like to see the evidence for the survival of the Greenland Norse to c. 1600. That’s nearly a century later than most current estimates. Here are six different global temperature estimates for the interglacial at 400,000 years ago [Antarctica Epica DomeC, Lisiecki-Raymo (04), Lisiecki-Raymo (09), Zachos (05), and Lawrence (10)]. One can get anything from 18,000 to 30,000 years for how long that interglacial lasted. Regarding how long the current interglacial will last, here are two zoom-in charts of June solar insolation at 65N (from Berger and Loutre 91). This value needs to drop below 470 W/m2 to kick us into an ice age going by paleoclimate history. It drops very, very marginally in the next 1500 years and then goes back up again. After that, we don’t get close to the trigger point until 52,000 years from now but more likely 125,000 years from now. This will be the longest interglacial by quite a margin since the ice ages started. The Milankovitch Cycles are not as regular as people think. Don’t know why my comment didn’t post–I’ll repeat. We took an unusual deviation to the north on the flight from Reykjavik back to Dulles and flew the length of Labrador after crossing the Davis Strait–which had the largest iceberg field that was remote from any pack thatI have ever seen. At any rate, there was partial snow cover all the way down to where the roads begin, which would be around Churchill Falls, at latitude 53. Date was June 26. Amazing. We actually wrote a paper on historical Greenland melt and of course the climategate goons called for the head of the editor for merely publishing it. Indeed there was probably higher ice loss in the 20s and 30s. Yabut, the glacier IS retreating! I emphasized the quote “was not subdued by radiative forcing”. What the authors meant by this was that, since this interglacial was at a minimum node of eccentricity and precession index oscillation, insolation did not go down to as low a level as one normally expects to be needed to set off glaciation. But glaciation started anyway. This is because other factors were involved. Insolation is only one of a matrix of factors. Another important factor is obliquity. Glacial inception ALWAYS happens during falling obliquity, never during rising obliquity. (We’re in the middle of a down-cycle of falling obliquity now.) Tzedakis also makes a lot of bipolar interhemispheric seesawing. Its interesting to speculate that changing obliquity might somehow affect ocean currents by applying slow torques, perhaps so that when obliquity change is fastest, ocean currents can be perturbed. Fifteen hundred years sounds right to me. The East Antarctic Ice Sheet quit retreating over 3000 years ago. Since the Minoan Warm Period (at least) the hot peaks of Bond cycles have been declining & the cold troughs lowering. The next Little (or Medium) Ice Age or one after that might turn into the coming Big Ice Age. Or maybe not. I don’t think science has the Pleistocene glaciations all figured out. I do know it just won’t be the same without the megafauna. And I’m pretty sure that it will be bad for humanity, although we’re not liable to go extinct ourselves, even if fusion-powered blow-driers can’t keep the ice sheets from crushing temperate zone cities. Of all the places Warmists worry about the Greenland ice sheet is not one of them. I knew that it survived the Eemian warmer period when, as stated above, hippo paddled in the Rhine and Thames. ….Look, i am not trying to be argumentative here, If you think you have a good model for the Holocene duration…. From what I have read that is the critical controversy and the jury is still out. It gets warmer for a while, then it gets colder again. But then it gets warmer again later on. Add time scale as required. Rinse and repeat. I always think of it as “does the winter snow melt in the summer at 75N? ; does the sea ice melt out at 75N in August/September?”. All the action is at 75N, not 65N. The ice ages are really kicked off when the snow does not completely melt on Northern Greenland and Ellesmere Island in the summer at 75N. It is always going to melt out on the rest of the Arctic pennisula and land-locked North America at 65N, even in the deepest, deepest downturns of the Milankovitch Cycles. In addition, when does the Arctic Ocean basin remain completely ice-covered over the summer at 75N. There really isn’t a 65N and it is going to stay ice-covered at 85N. You know the Milankovitch changes are so small that it really shouldn’t be able to do what it does. The Sun is 2.0 degrees less high is the summer. Peanuts. That’s only equivalent to 150 kms or so. Pick a town 150 kms farther north than you and that is what the Sun is like in the summer. Hardly any difference. It is only the Albedo feedback which provides for the really large enough changes in solar insolation on the ground which cause the ice ages. And it is 75N which is succeptible to flip on the small changes of the Milankovitch. Last week, a community on the Beaufort Sea coast at 65N recorded a temperature of 34C. No snow is going to make it through summer when temps can get that high. In mid-June, the snow at Eureka Nunuvut Canada was already gone. Alert at 82N still has 1 cm. What is going to cause enough change so that the snow and ice stops melting in the summer at 75N. I don’t see a polar see-saw changing the fact that the snow melts at (lower altitudes) on Ellesmere Island in the summer and the sea ice melts in the Beaufort in the summer. A lot of change is going to be required to stop these two processes. And when it does, it is the Albedo feedback at this latitude then causes the snow to not melt at 69N a few decades later. A few decades later, now it is 68N. Then 67N, then a few more decades and we are at 66N. A few thousand years and glaciers are building up and starting to push south. Even more Albedo feedback. Now the glaciers cross into the North American mainland. A few thousand years more, etc. etc. Long-winded and maybe hard to understand what I mean, I know, but that is how it must be. I have a really dumb question for Dr. Michaels. When I see graphs plotting +100Kyr temperature and ice volume, it looks like they are in phase. I would have thought that the *rate of change* in ice volume best correlated with temperature. When it’s hot ice melts fast and when it’s cold ice accumulated fast (on my driveway anyway). What am I missing? Glaciers might “ground” occasionally, then over time, the ground is worn away by the glacier. The ice grabs, as ice will do, rocks that will grind anything in its path. Flow rates at depth, need more study. Ice is a sticky phenomenon, pilots hate it cus it adds weight to the airplane while changing the shape of the airfoil, ships at sea get top heavy. Why is it so sticky ?? Thanks for the explanation, 75N is clearly a latitude to watch. The Milankovich forcings are indeed very weak, this is an interesting point. My interpretation would be that they are weak forcings of a nonlinear oscillator, they set the frequency of the oscillator with very small but periodic inputs, the nonlinear system itself provides the rest of the forcing from feedbacks such as albedo. Typically the relation between forcing and resultant periodicity is complex – e.g. 3 million years ago a glaciakl regime began with interglacials every 41,000 years – corresponding to the obliquity cycle, then 1 million years ago it switched to 100,000 years periodicity matching the eccentricity cycle. This to me shows a system finely balanced between glacial and nonglacial. If anything there is a slow descent into deeper glaciation with frequency of interglacials intermittently reducing. Perhaps in the future is permanent glaciation with no interglacials. One blogger here gymnosperm considers that the earth is heading into a periodic deep glaciation on schedule as it has at 150 million year intervals, perhaps linked to galaxy rotation. Even a snowball earth comes into the frame, not a pretty picture on a planet with several billion human inhabitants. BTW – are there any other periods of geological history where glacial periods were punctuated by interglacials – or is the Pleistocene the only one? Maybe the record hundreds of millions of years ago does not have the resolution? The Carboniferous ice age clearly had many periods of glaciation followed by melting. Temperatures and sea levels cycled up and down many times between a large range. (the large sea level changes participated in the amount of coal which formed in North America and Europe (at the equator) as the large peat swamps were repeatedly buried by marine sediments over and over again which is how the “age” got its name). The resolution is not high enough however to equate it with the Pleistocene ice age cycles. I might interpret it as periods when the land of Gondwana at the south pole was repeatedly pushed below sea level by the weight of the glaciers. This then lead to the glaciers melting again as the ocean invaded. Glaciers form on land, not on the ocean. After a long period of continental rebound, the glaciers came back which then started the cycle of pushing the crust down again and so on and so on. Think Hudson Bay which is only below sea level today due to the weight of past glaciations and the glacial flow channels which form the Arctic Archipelego (and northern Asia also has a huge continental shelf margin which extends far out into the Arctic ocean). Um , that equates to 400 mya, or 400,000,000 years ago. the land of Gondwana at the south pole was repeatedly pushed below sea level by the weight of the glaciers. This then lead to the glaciers melting again as the ocean invaded. Glaciers form on land, not on the ocean. After a long period of continental rebound, the glaciers came back which then started the cycle of pushing the crust down again and so on and so on. H2O, in all it’s phases, really is in charge, isn’t it? Agh. A pet peeve violation call on myself: “its phases”.